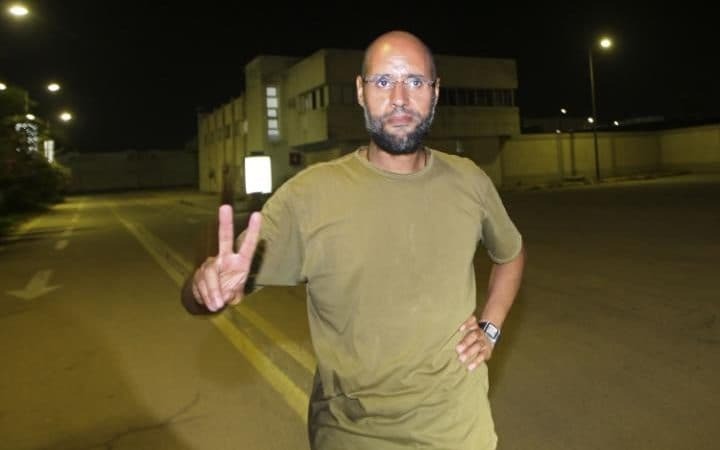 On June 10, British press reported that Saif al-Islam, PhD, the British educated son of Libyan leader Muammar Qaddafi has been released from jail and is living among his uncles and relatives in the eastern Libyan city of al-Bayda. He was released on Saturday by Abu Bakr al-Siddiq Battalion loyal to General Khalifa Haftar’s Libyan National Army. United States Marine Corp General Thomas Waldhauser, the commander of US Africa Command, has accused Haftar of being backed by the Russian Federation. Gen. Hafter, a CIA asset lived near CIA headquarters in Virginia for 20 years. And before coming to the US, he led a failed CIA-backed coup against Colonel Muammar Qaddafi led regime in the 1980s. Since so-called Humanitarian Liberation of Libyan, the country had been divided into three entities – Tobruk-based government headed by General Khalifa Haftar; UN-backed government of National Accord (GNA) in Tripoli, which has struggled to exert its authority, and the National Salvation Government, also in Tripoli. Six years ago, Libya was invaded by the US-France-Britain and NATO to bring a regime change. Muammar Qaddafi, was captured and publicly lynched for being a threat to Israel. Saif was captured in Zintan in November 2011 as he was fleeing to neighboring Niger after opposition fighters seized Tripoli. He was sentenced to death in July 2015 by a court in Tripoli in a mass trial of former Qaddafi government officials. Saif is wanted by the International Criminal Court (ICC) on charges of war crimes and crimes against humanity. ICC has refused to investigate former French president Nicolas Sarkozy, US president Barack Obama, and British prime minister David Cameron for destroying Africa’s most rich and independent nation while murdering hundreds of thousands Libyan civilians. Saif was never part of the Qaddafi regime, spending much of his time in London moving around the gilded circle of rich tycoons, academics and Tony Blair’s political elite. Six years after the destruction of Libya as a unified nation – with three governments fighting each other and US-Israel created ISIS, Saif Qaddafi may find a new role as part of the solution rather than the problem. “Who would have thought that after publicly lynching Colonel Muammar Qaddafi in October 2011 and sentencing his son Saif al-Islam Qaddafi to death in July 2015, that the younger Qaddafi would be pardoned in less than a year and Libyans urging the family to help save the country from the mayhem? Further, his mother has been allowed to return to Libya as have a number of other former officials of the Qaddafi regime. Now, the elected representatives of Libya have realized that there can be no peace without the help and support of the Libyan,” Jamahiriya, Qaddafi’s political movement that had ruled the country for 42 years. They are turning to Saif al-Islam to help rescue the country” wrote my Canadian friend, writer and author Zafar Bangash last year.